Not only does Riggun love horses but he loves sports. Everytime he sees any kind of ball he heads straight for it. He acutally has a pretty good throw. 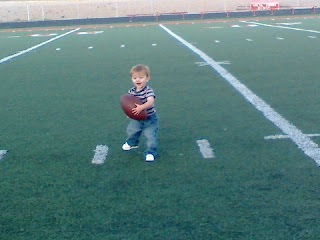 He really likes playing football with cousin Boston. They went out on the college football field after cousin Brilee's soccer game and ran around throughing that football around. It was so cute cause the ball was about as big as them.